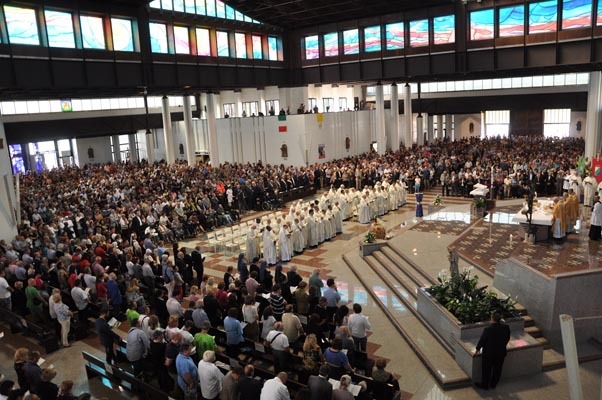 On the morning of 21st September, 2014, the new Shrine of St. Gabriel in Gran Sasso, Italy, was consecrated. The Rite of Consecration (that lasted approximately three hours) was presided over by the Special Envoy of Pope Francis, Cardinal Ennio Antonelli, Archbishop of Florence and now President Emeritus of the Pontifical Council for the Family. On the occasion of the consecration the Pope Francis sent to a special letter that was read at the beginning of the Mass. 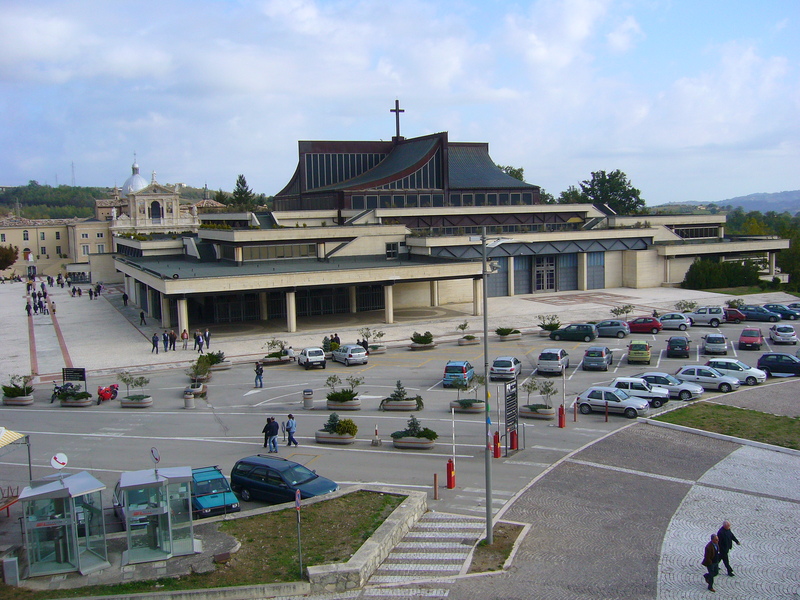 The consecration of one of the largest contemporary shrines of Europe that is visited each year by two million pilgrims, was attended by the bishop of Teramo-Atri, Bishop Michael Seccia, the bishop of Sanggau (Indonesia), Bishop Giulio Mencuccini, and the Superior General of the Congregation of the Passion, Most. Rev. 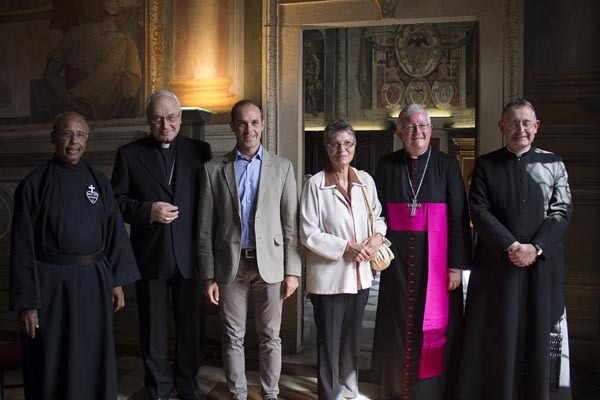 Joachim Rego and the General Council of the Passionists. Also present were the Provincial Superior of the Passionist PIET Province, Fr. Piergiorgio Bartoli, as well as many priests, religious and civil and various members of the military. 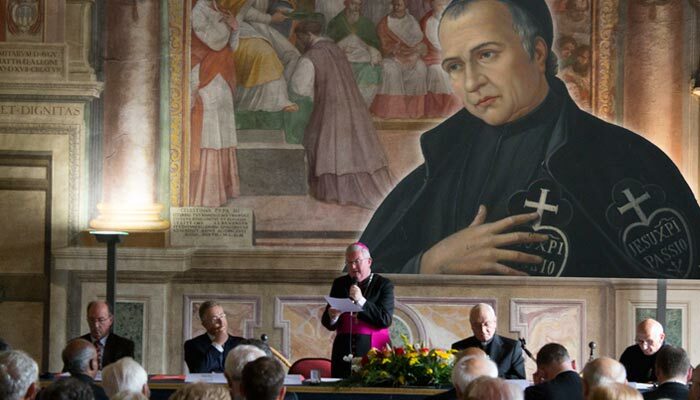 Also some relatives of St. Gabriel from Rome were in attendance as well as some delegations of immigrant associations from Philadelphia (USA), Melbourne and Brisbane (Australia) and Dour (Belgium). At the end of the celebration a dedicatory plaque commemorating the consecration was unveiled. The Rite of Consecration was attended by more than five thousand faithful, but throughout the day almost ten thousand faithful visited the Shrine. All powerful and ever living God, you made your bishop Saint Vincent Mary Strambi a devoted shepherd of your flock and a faithful servant of the Church. Strengthen us by his example to love our neighbour and work for justice as members of your Church. We ask this through our Lord Jesus Christ, your Son, who lives and reigns with you and the Holy Spirit, one God, for ever and ever. Amen. 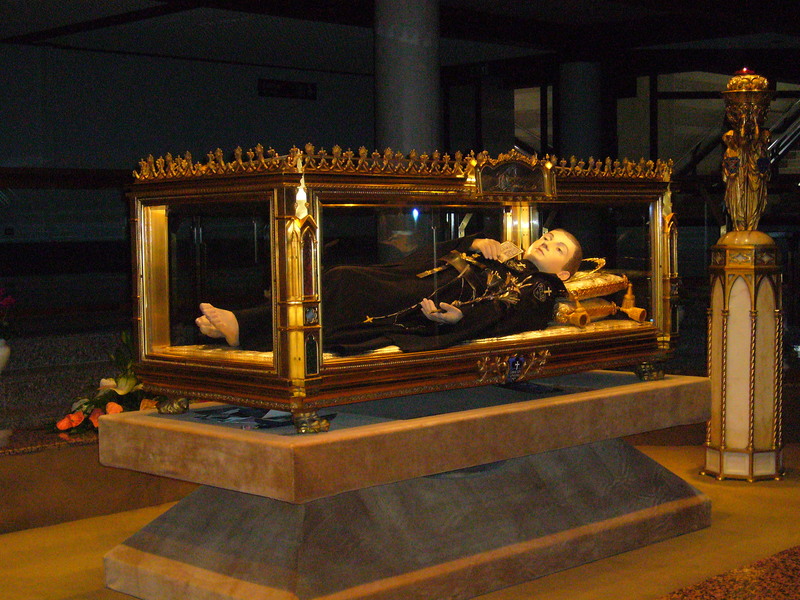 Lord, we offer you these gifts on this memorial of Saint Vincent Mary. Grant that we may follow his example by living in the spirit of Christ’s gospel and working to spread its message throughout the world. We ask this through Christ our Lord. Amen. Lord, we have received our strength with the bread of heaven. May this food of love strengthen our spirit and inspire us to serve you in our neighbour, for you are Lord for ever and ever. Amen. 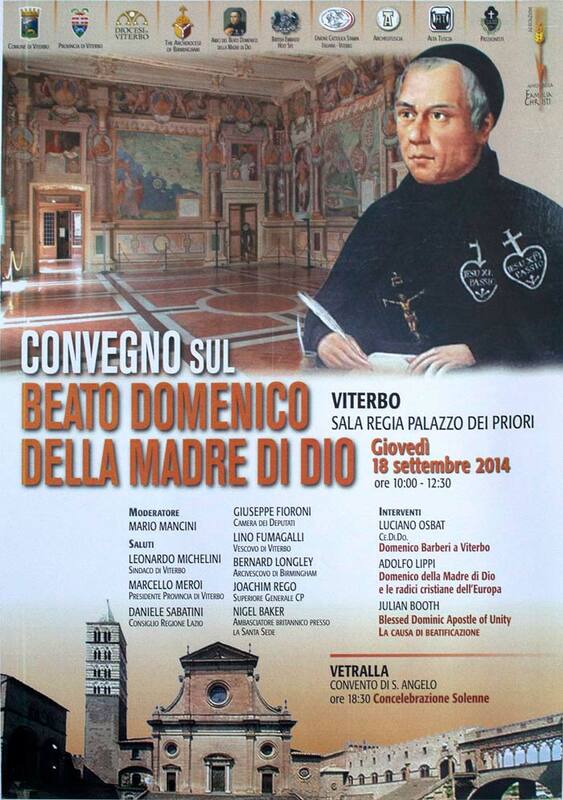 On September 18, 2014, a Conference on Blessed Dominic of the Mother of God was convened in Sala Regia of Palazzo dei Priori, Viterbo, Italy. The Conference was attended by Most Rev. Fr. Joachim Rego, CP, Superior General of the Passionists, Most Rev. Bernard Longley, the Archbishop of the Diocese of Birmingham (United Kingdom), Most Rev. Lino Fumagali, Bishop of Viterbo and His Excellency Nigel Baker, Ambassador of United Kingdom to the Holy See. Civil officials from Italy were present also in the conference: Mayor Mario Mancini of Viterbo, President Marcelo Meroi of the Province of Viterbo, Councilor Daniele Sabatini of the Lazio Region, and Mr. Guiseppe Fioroni from the House of Deputies. Two descendants of Blessed Dominic attended the conference. Pilgrims from the Archdiocese of Birmingham (Friends of Dominic) and many devotees from Italy also participated in the convention. I have been on many papal trips to foreign countries over the past thirty years and have experienced some profoundly moving and faith-filled moments on several of them but I had never before seen a Pope so overcome with emotion that he wept. But that is what I witnessed on Sunday evening, September 21, in the cathedral of Tirana, Albania. It all happened when Don Ernest Simoni, an 84 year old Franciscan priest from Albania told the story of his personal martyrdom under the brutal communist regime of Enver Hoxha. He told it in the presence of Pope Francis and a church packed with cardinals, bishops, priests, women and men religious, seminarians and members of lay Catholic movements. Reading from a prepared text and speaking without any emotion, the elderly grey haired priest told how he was arrested on 24 December 1963, immediately after celebrating the mass of the vigil of Christmas, and how he spent the next 27 years in prison, during which he experienced all kind of suffering and torture. He recalled that he was interrogated some months after his arrest and an officer told him, “You will be hanged as an enemy because you have told the people that we will all die for Christ if necessary.” They tortured him because they wanted him to speak out against the Church and the hierarchy, “but I would not do so,” he said with great humility. He recalled how they tied his wrists so tightly with irons that his heart stopped beating and he nearly died, “but the Lord wanted me to continue living.” They condemned him to death but the sentence was never carried out. There was total silence in the church as he continued to recount the heroic story of his personal martyrdom, until the day he finally gained his freedom. He then went towards the Pope to kiss his hand, but as Francis got up to embrace him the old priest went down on one knee before him. Francis pulled him up, kissed his hand and embraced him for a long time, and then put his head against his and wept. The Pope turned to the altar, took off his glasses and wiped his eyes with a handkerchief. Then, as scheduled, a second witness to the faith came forward: an 85 year old nun, Sr. Marije Kaleta, of the Stigmatine Order. She too told the story of her life and sufferings in that same era under the communists, and with the same detachment as the priest. When she finished speaking the Pope got up and embraced her too and blessed her. Three hours later on the flight back to Rome, when a reporter asked what he had felt as he listened to those extraordinary testimonies, Pope Francis admitted that he had totally unprepared for all this, he had not expected it. “We were all deeply moved,” he said in a voice that still conveyed emotion. He revealed that he was particularly touched as he listened to the old priest speaking of his own martyrdom in such a humble, detached way as if all that had happened to someone else and not to him. 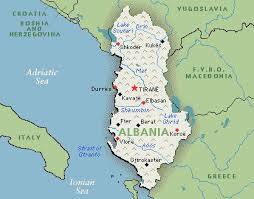 The Jesuit Pope went onto reveal that before going to Tirana he had spent two months studying the history of the persecution in Albania (under the communists), “but I had not realized that this people had suffered so, so much. It was a surprise for me,” he confessed. Pope Francis came to Albania was to honor the martyrs, but he had not calculated on experiencing anything like this. Nor had I. Two survivors of Albania’s communist crackdown against the church brought Pope Francis to tears with their stories during a vespers service in Tirana’s cathedral Sept. 21. Franciscan Father Ernest Simoni, 84, talked about his life as a priest under a militant atheist regime that targeted people of every faith — Christian and Muslim — between 1944 and 1991. Despite the risks of torture, imprisonment and execution, people held onto their beliefs as best they could, praying and passing on their traditions underground. 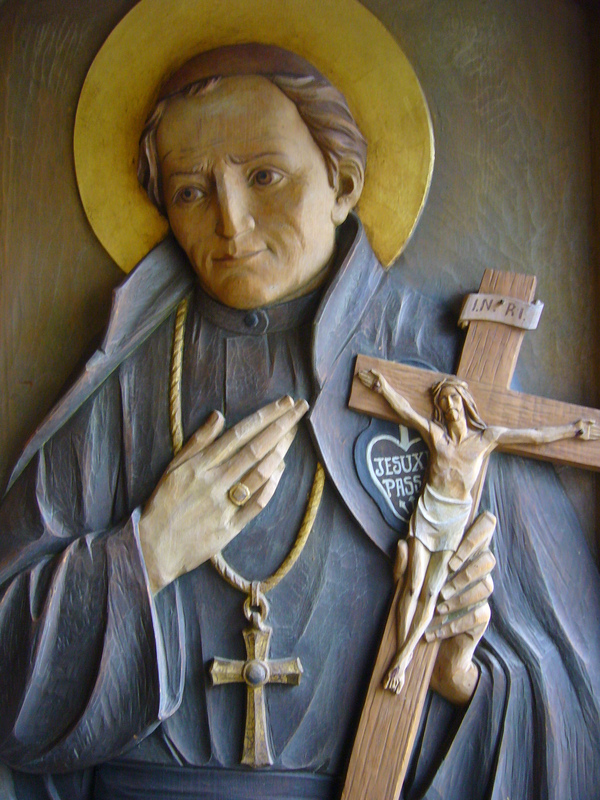 He managed to be ordained a priest in 1956, on the feast of Divine Mercy. But the worse was yet to come when the regime, which was set to become the first atheist nation in the world, intensified its war against religion in the 1960s. On Christmas Eve 1963, the priest was arrested while celebrating Mass and was sentenced to death by firing squad. He was beaten, placed for three months in solitary confinement under “inhumane” conditions, then tortured because he refused to denounce the church. All the time he was imprisoned, he said, he celebrated Mass from memory in Latin, heard confessions and distributed Communion to other prisoners — all clandestinely. When the regime collapsed in 1991, he returned to ministry by serving isolated mountain villages, urging Christians caught up in a cycle of revenge to let go of their hatred and embrace God’s love. When the priest finished his testimony, he approached the pope, who extended his arms to embrace him. But the priest dropped to his knees to kiss the pope’s ring. Standing together, the two men embraced warmly. 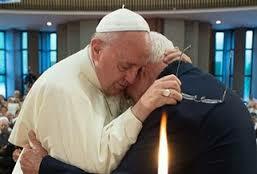 Moved to tears, the pope removed his glasses and the men briefly rested their foreheads against each other. Stigmatine Sister Marije Kaleta, 85, spoke next about being a novice during the regime and secretly baptizing “everyone who came to my door,” but only after making sure they weren’t spies who wanted to turn her in to authorities. One day, while walking along a road, a mother carrying her child ran up to her, asking her to baptize the infant. Sister Kaleta was hesitant because the woman’s husband was a communist and she worried it might be a trap. So she told the mother it wasn’t possible because she didn’t have the things necessary for baptism. The mother appeared desperate, and even though they were in the middle of a road, she pointed to a nearby ditch saying that’s where they could get the water. Still unsure, the sister said she had nothing with which to pour the water over the child’s head. “But she insisted that I baptize her child. So, seeing her faith, I took off my shoe, since it was made of plastic, and I took the water from the canal with that and baptized the child,” she said. Thanks to a number of priests who also worked clandestinely, “I had the good fortune of having the Blessed Sacrament,” which she kept hidden in bed sheets to secretly administer to people who were ill or dying. The pope said he had had no idea how much the people of Albania had suffered for their faith, until two months earlier when he started preparing for his trip. 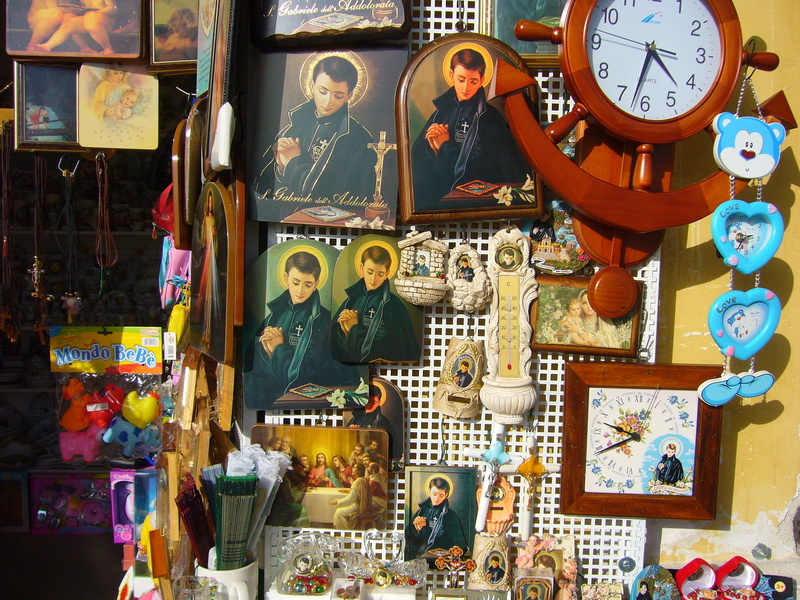 He said he was moved to see Tirana’s main boulevard lined with banners bearing black-and-white photographs of dozens of Catholics killed by the regime. 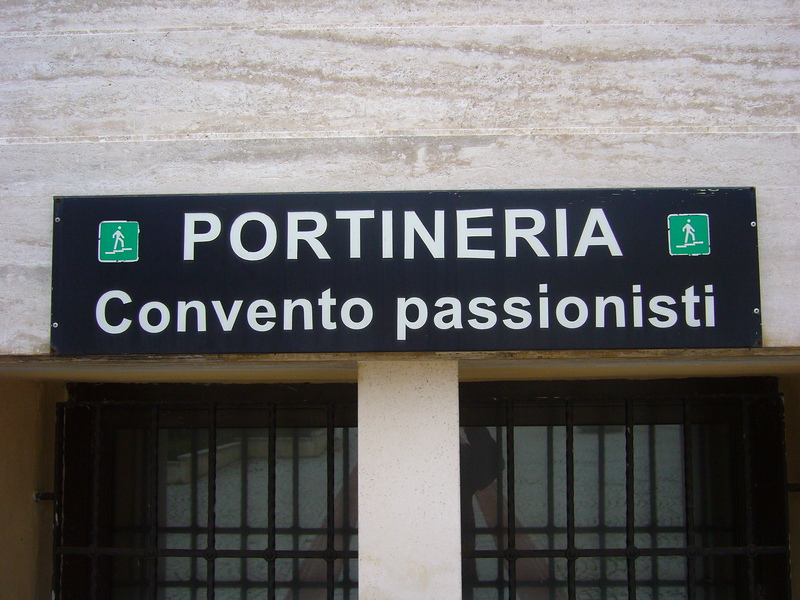 Their cause for canonization as martyrs of the faith is being considered. The pope said Father Simoni and Sister Kaleta “performed a service for us: consoling us” by showing that God always provides the strength and hope to confront and overcome the tiniest inconveniences and the worst atrocities. Why do Christians exalt the Cross of Christ?” asked Pope Francis of pilgrims and tourists Sunday 14th September who had gathered beneath the window of his study for the midday Angelus. Because, he told them, that Cross on which Christ was nailed “is the source of the mercy of God that embraces the whole world”. It’s not just any cross, it is the source of our salvation. And today – on the Feast of the Exaltation of the Holy Cross – the Pope said we should pray for Christians who are being persecuted and killed because of their faith in Christ. “This happens especially there where religious freedom is still not guaranteed or fully realized. It happens, however, even in well-to-do countries which, in principle, protect freedom and human rights, but where in practice believers, and especially Christians, encounter restrictions and discrimination. So today we remember them and pray especially for them”. The Pope also warned against considering the cross a sign “magic”: “The Holy Cross …. is not a sign of ‘magic’! 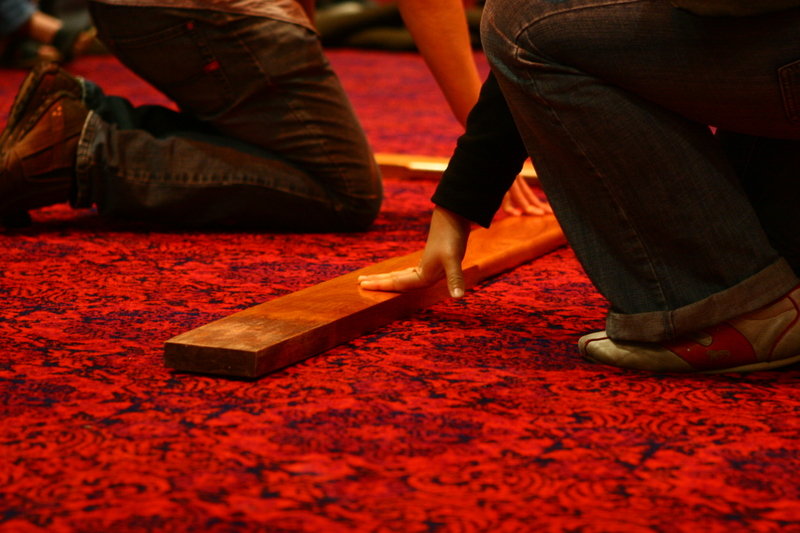 Belief in the Cross of Jesus involves following Him on his path. Thus Christians collaborate in His work of salvation by accepting together with Him sacrifice, suffering, even death for the love of God and neighbour”.